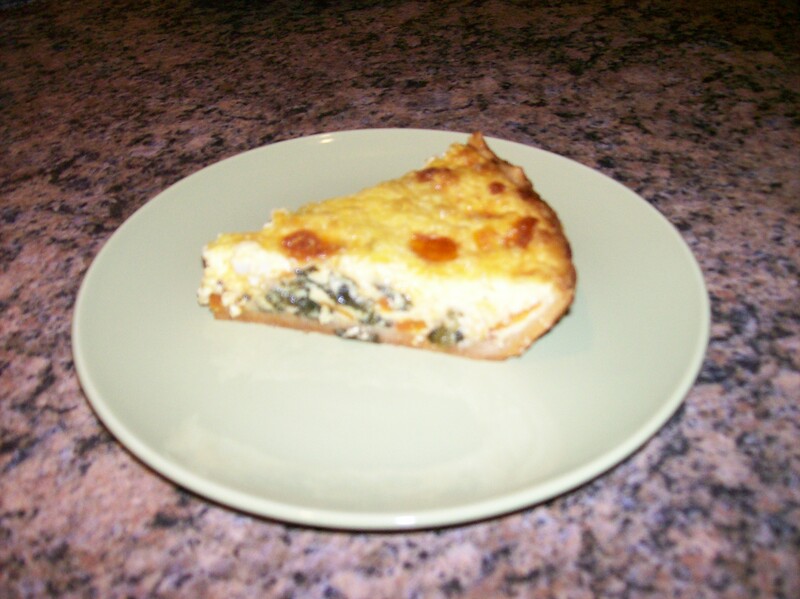 Tonight’s dinner was a Spinach and cheese Quiche. The recipe was really easy to follow. We made a few changes to the ingredients. It called for ½ C of Gouda, ½ C of Sharp white Cheddar. We changed that to use Muenster and Sharp Cheddar. 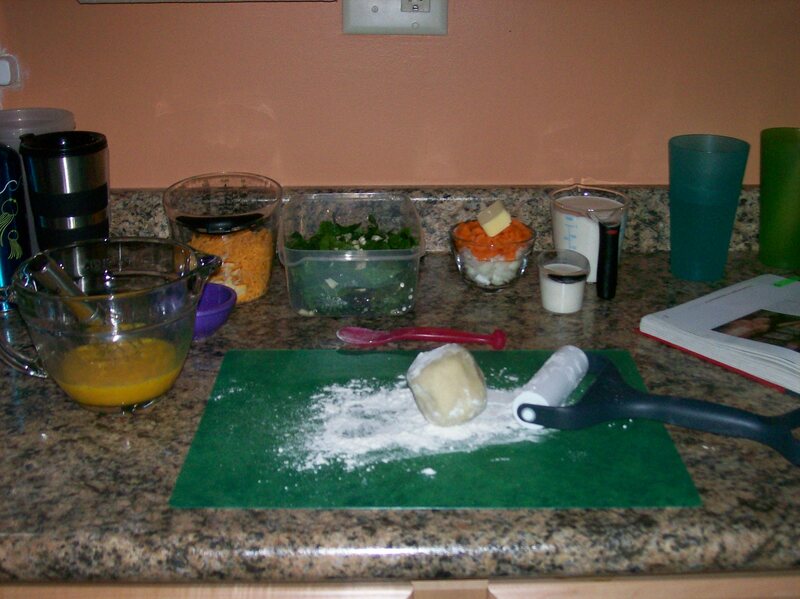 We also added ¼ C of coarsely chopped Carrots. The wife also switched up the eggs, she used 2 duck eggs instead of 3 large eggs. I sautéed the onion and carrots together in the butter until both were soft about 8-9 min. The smell those two gave off was enriching and delightful. After they were soft I added the spinach and chopped garlic, I sprinkled a little Olive Oil on top of the top leaves to make sure all got a nice coat of oil and would not burn. I also cooked these a little longer than instructed, for about 9 min, but not more than 10. I let the pan sit for about 10min to cool, then I placed it evenly over the bottom of the pie crust. 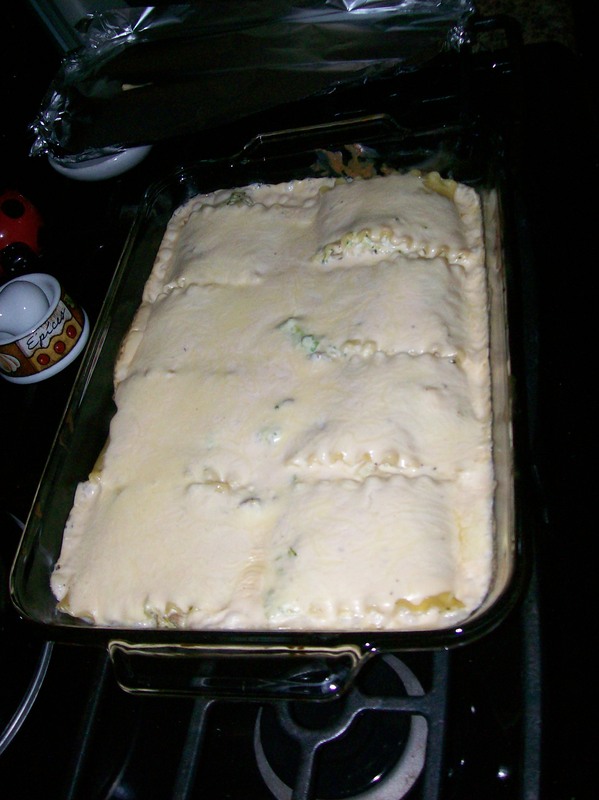 I spread the mixture of cheese over the top of the spinach and got this as even as I could (it was still a little warm so the cheese started melting), next I poured the cream mixture over the top. 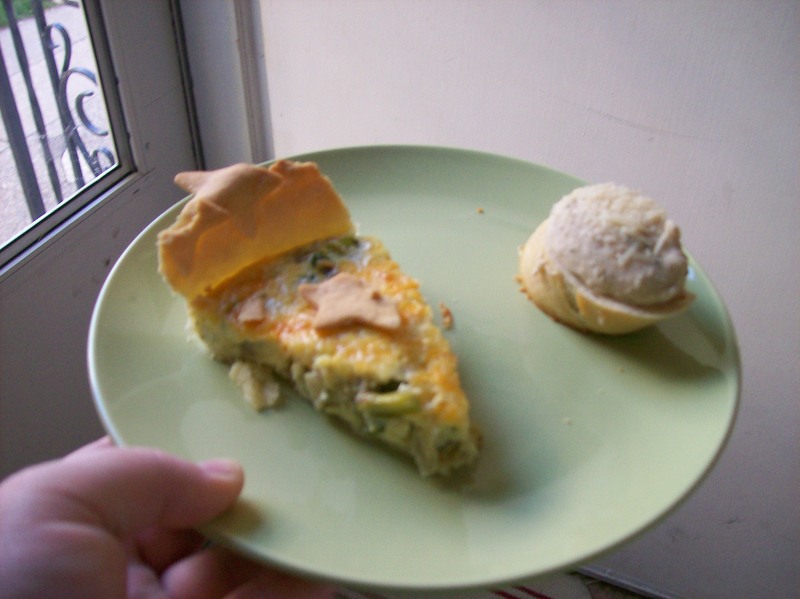 I baked the quiche for about 55 minutes. It started smelling so good I had to keep checking on it to see if it would magically get done sooner. When the baking was finished and the knife came out clean, I left the meal in the oven to cool for about 12-15 minutes – I had to bath baby E. Then it was sliced and served. It was VERY good! I would not change anything I altered in this recipe. This meal was perfect. It was very light on the cream and rich in flavor. You did not have an over powering of one flavor over another. There was a great combination of flavors. I definitely recommend my altered recipe to anyone. 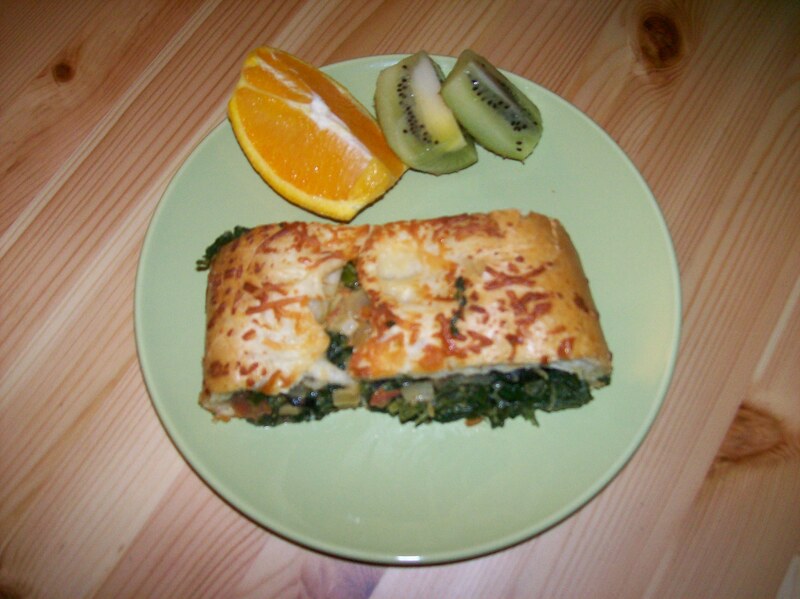 Wednesday – Savory stuffed loaf – Great American Home Baking – card 13 of main dishes – So this meal WAS supposed to be cooked by J, however he is on his way to Lansing so I am stuck with the duties. He said just order out and I said, “nope… we are going to do this cooking at home thing, so I am cooking at home.” So I suited up in my apron and started going. 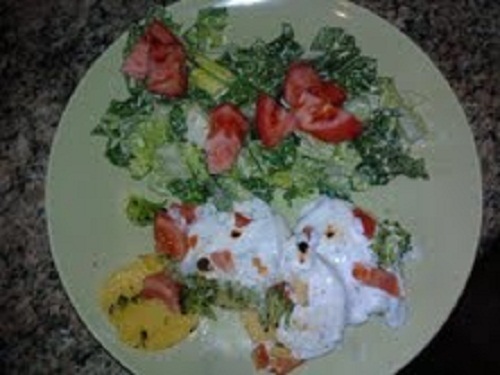 Now I will say I was not too thrilled about cooking this meal since I DIDN’T choose it, but hey we have to eat right?? 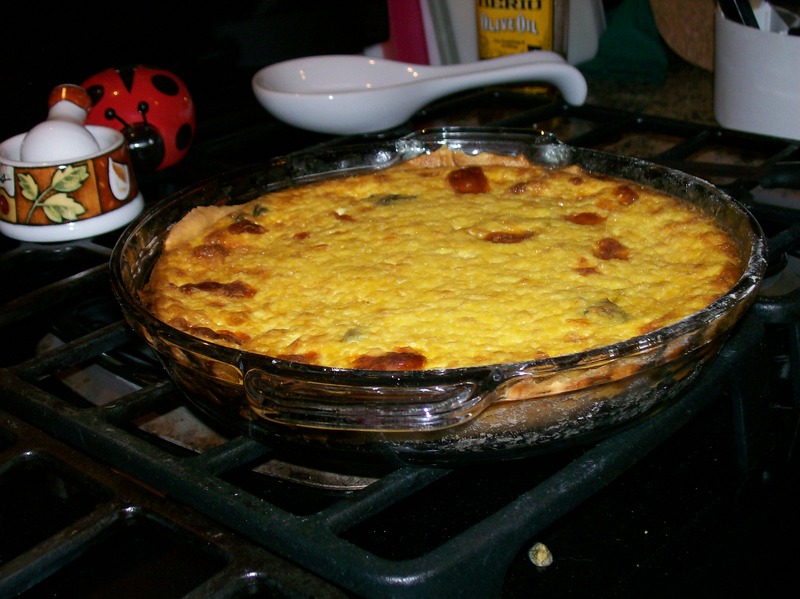 Here is what I did… I changed some things in the recipe – are you surprised?? I started off adding more onions, we love onions so I added an extra ¼ cup (if they have true health benefits then I’m only helping), I also added more garlic (we love garlic as well – I used 4 instead of 2). I added the called for amount of tomatoes since our oldest S isn’t too found of them, which is ok. I also added a few more ounces of frozen spinach, if I didn’t we would have had 2oz left over in the freezer – which would make no sense. I added the called for amount of black olives, add nearly 2x the amount of cheese (we love cheese – we love food). Also when I pinched this loaf together I really didn’t read the directions… I just pulled the ends together and pinched – didn’t go so well (we’ll see how it looks when it comes out), if I were you I’d do what the recipe calls for. Also, it calls for breadcrumbs… well J forgot to buy those at the store, so only parmesan it is!! We, meaning J, has made this loaf before and have served it at gatherings and have good feedback… we’ll see how mom’s turns out. Oh and I sliced my thumb… hey J that wouldn’t have happened if you were cooking! 😛 (oh and if you are like me… as you were slicing the olives you were eating them, as well as the left over tomatoes… mmmm I love snacking and cooking) So dinner came out great, even though I didn’t fold it “correctly” – S said it was good, he gave me an A+ for my firest time he says!! Yahoo for mom being a good cook!! What would I change… maybe the way I fold it, also I might try it on parchment paper and see how that goes. Clean up wasn’t horrible, I just thought it might help keep the bottom a little softer… don’t get me wrong the bottom was fine, I just don’t want to dirty 3 knives, I want to it to cut with a fork. 😉 Note – there were no leftovers to comment on. This one was gone FAST! Friday – leftovers – well there were supposed to be left overs, however… there were none! So today was pick a local resturant and eat there day. With our little test coming up we are going to have to find local diners that shop locally for their produce/food. I know of a couple, but I think we are going to need to find more to accomodate nights out. 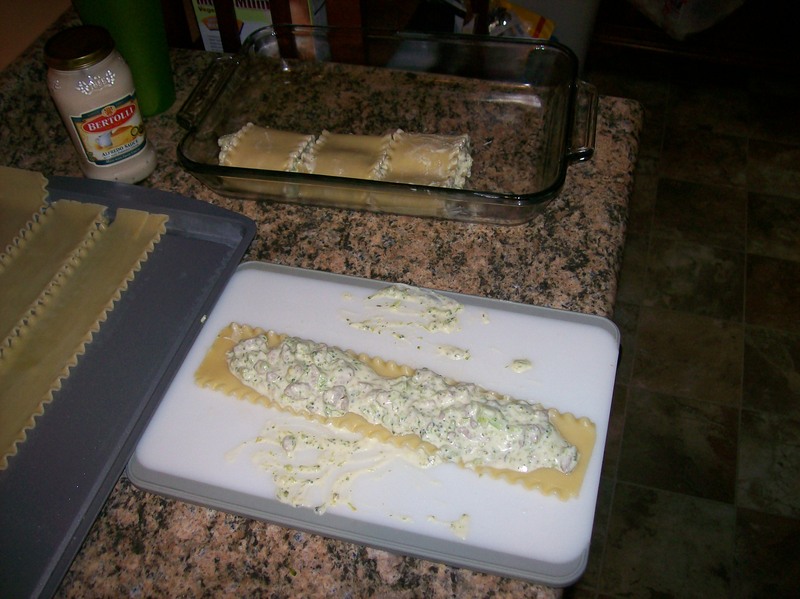 Saturday – Turkey/broccoli filled lasagna rolls – BHG: New Cookbook – page 355 – these were fun to make together (hubby J helped out). So here is what we did differently, first we doubled the recipe… sorta. So we cooked 9 noodles, instead of 4, we cooked 2 cups broccoli instead of 1, we added 2 cups ricotta instead of 1, we used a giant duck egg instead of 2 chicken eggs, we used twice the dried amt of thyme, and instead of red sauce we used alfredo, but only 15oz, not 24oz. So here is what we learned. Cook the meat/broccoli/onion first so it can be cooling while you cook your noodles, then cook your noodles… while those are cooling whisk up your egg/ricotta. Cooler noodles are easier to work with, put a little bit of oil in the water so they don’t stick however when you have them on a surface. We let the broccoli/meat/onion mixture cool so it didn’t go into the ricotta/egg hot and start “cooking” them, this seemed to work well. When you start rolling it is messy, have fun!! Seam side down, top with sauce and bake covered. 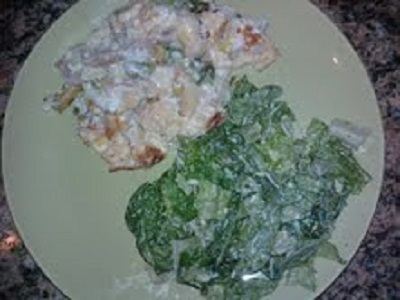 I put the parmesan on and let it stay in the oven while we prepped the table and sliced some fresh apples. This melted the cheese and let it “solidify” up for pretty serving. From our 9 noodles we got 8 rolls (good thing we did extra, one of our noodles split down the middle), there are 3 left over for tomorrow’s lunch. We’ll comment on how they are as microwaved leftovers and let you know. 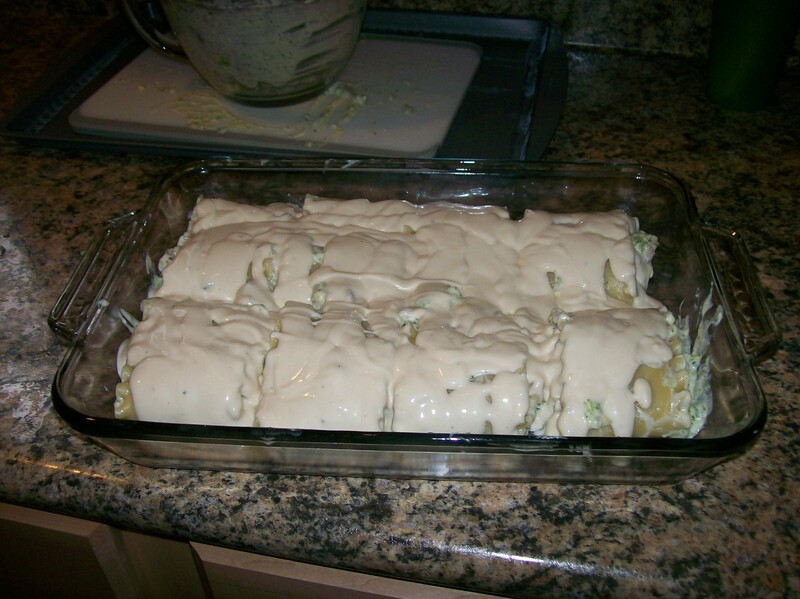 Sunday – Spinach and Chicken lasagna stacks – FWF – page 136 – what to say about this recipe. First my husband cooks and he sometimes rushes, and sometimes doesn’t think when he is rushing. He was supposed to post this recipe review, but I think he is a little upset with it’s outcome and refuses. Here is a little story about J and his rushing/not thinking when cooking. We were making soup in the crock pot, a chicken/rice soup. I started the soup and he was supposed to add the rice about 45 mins prior to it needing to be served. Well he started pouring the rice right on time… and he kept pouring, and pouring… he kept pouring because he couldn’t see the rice and he wanted to make sure there was enough rice. All the while he is pouring he is not thinking that rice EXPANDS. So needless to say it was a very creamy mush type soup… the baby LOVED it blended up, but the rest of us chewed our way through. Well using this rice story as a base, let us discuss last night. J was cooking and was doing great. It was my job to wash the spinach – and prepare the fresh veggie/fruit side dish (this means carrot and apple washing/slicing). We were setting the table, feeding baby E and J was finishing up the sauce. Well he decided it was too thick for him… so he added more flour, then some more flour… he kept adding until it seemed thick enough – again not thinking. We know that flour would make the sauce even thicker… if he added it slowly and waited between adding more it might have worked. But because he added so much so fast… well it made glue. Dinner was a bust. He ate two servings – he admitted he did it because he felt bad – S ate one and then had ramen he bought himself at the store, and I just had a few bites and it was too “thick” and was making my tummy upset. So here is a challenge for anyone reading. Please make it better and share your secrets and thickening techniques… we would love to hear if someone made a good meal from this one. Ok so the Fulton Street Market is still not up and fully running… but the few vendors that are alwaysset up about a block away were there this morning, we paid them a visit. We wanted to see what was coming in and what the producers were expecting to have when they got to the actual market a few weeks from now. There were two cheese guys out, one of which talked to me a bit about making my own mozzarella. The bread man was there and boy did his little area not only smell good, but it all looked sooo good. We talked to a meat/egg lady about her raw milk movement, her inability to bake and how well her duck eggs may enrich our meals. Our oldest, S, purchased himself a succulent plant – hens & chicks I believe is the name she gave us. He wasn’t the only one with purchasing power however… we were shelling out the cold hard cash as well. Here is what we got and what we plan to do with it… other than eat it. We picked up ½ dozen duck eggs, I have wanted to try these forever and the lady said they actually do better in baking she has noticed… we shall see. We purchased 1 loaf of tomato/basil bread (also asked this baker where his ingredients came from, local he said and gave me names of his producers). We bought a tub of carrots, a tub of fresh spinach and a tub of apples. We visited the other cheese guy and bought a loaf of smoked jack cheese, it looked great – oh the possibilities. This cheese vendor also carried raw milk cheeses, all of which (raw and not) are made from local cattle acquired milk. MmMmmmmm… I was surprised to see tomatoes at market, but one producer had a green house he keeps warm and sure enough he had heirloom tomatoes out. There were milk vendors, meat vendors and even a guy selling fresh baked cookies/bread/sweet treats! Along with all this yummy food there were plant vendors selling hanging baskets, succulents, herbs, etc… S was so excited and couldn’t be stopped in shelling out $1 for his succulent… he talked with the vendor asking her all sorts of questions on how to best take care of his plant. How awesome. On the way home he was talking about starting his own garden… except everywhere he wanted to place it the dogs went and did their business… so he is on planning mode, trying to see if he can work something else out. So how much did we spend? S spent $1, we spent (for our: carrots, spinach, apples, cheese, bread, duck eggs) $24… the apples will get us through the week as snacks and desserts for dinner (there were ~ 10 apples), the spinach will get us through 2-3 dinners, the carrots more like 3-5 dinners, the cheese will vary depending on how good it is, and therfore how quickly it might get eaten… 😉 the bread could make up to 3 stratas (if we wanted that many) the duck eggs are the size of an XL reg egg, so I am sure they can last the week. So we will design our meals around these products and pick up the extras from Ken’s. I hope in a few weeks more goodies start making their way back to the newly refurbished market…. I sure do look forward to FULL market meals starting in the next few weeks.